It’s certainly been a challenge and change of pace to transition from the Mid-west Calo Teens & Preteens with 40+ golden retrievers to the idyllic, small East-coast town of Winchester, VA to work with emerging young adults. This past July I loaded up my SUV including a pregnant golden retriever, Princess Leia, and drove east to relocate and begin a new adventure at Calo Young Adults. We created a world class canine therapy program that’s incredibly effective at facilitating transferable attachment with adopted teens at Calo Teens in Lake Ozark. What would that therapy program look like for young adults? How could I enhance the program already in motion here to better meet their needs? Go big or go home, I guess! The staff welcomed our very pregnant Princess Leia with open arms, eager for the novelty and possibility available. 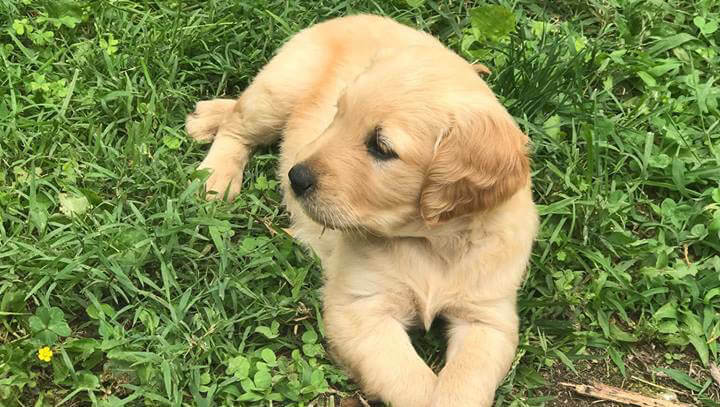 Rather than start small with a couple of adult golden retrievers, let’s experience a full litter of puppies from birth! Thus far, the best aspect of CYA is the carpe diem mentality fostered by students and staff, which can be sustained by the enhanced maturity and safety of the young adult clients here. 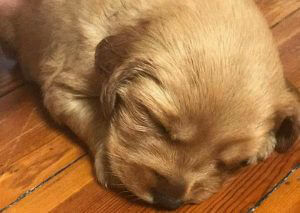 Why not offer these young adults the experience of raising goldens from birth? Seizing the day, we have embraced the opportunity for an imprinting training strategy for our newest litter of goldens, early neurological stimulation. Developed by the US military’s canine training program this form of training promotes resiliency to stress and duress in canines. Essentially, it helped prevent military dogs from returning from war with PTSD. By exposing the pups to different, mildly stressful yet brief forms of stimulation each day they can build long-lasting resiliency. I’m able to walk our students through this process. An example of this would be to hold one of the pups in your hand, taking it away from warmth and comfort, and place the puppy on its back in the supine position. At such a young age this is slightly frightening and stressful. However, if after the mild stress you bring the puppy back to your chest to warm, cuddle and soothe, a sense of resilience is formed. Before I could even broach the concept and facilitate a group discussion, a student took a quantum leap and asked how this could apply to humans. As a survivor of her own stress and duress, this young woman saw the benefit a training like this could have in preventing trauma and PTSD in children. She declared, “Somebody should study this! A baby could benefit from this. I could have benefitted from this.” While this is a beautiful, hands-on training and bonding experience with our newest canines, it’s also been a wonderful opportunity for students to make some deep realizations and connections in their own therapy and life experiences. Apart from the newest puppies, each student house has an assigned canine and each day has a different designated handler from that house. Interaction and caring for the canines is built into the daily culture here. It’s not a begrudging responsibility students must take on, but rather more of a willing duty to provide for the family canines. Just like at Calo Teens, students are able to work towards adopting a canine through essays and demonstrated time and evidence working through the CASA model with the canine. Even if students don’t form a connected relationship to the canine, they’re willing to care for their needs. For example, one student doesn’t often relationally engage with the canines, but is eager to play the piano as music therapy for one of our struggling puppies, Bodhi. 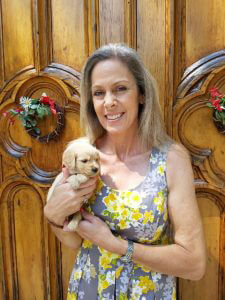 I’m expectant and excited to see what other new experiences and opportunities are in store for canine therapy at CYA. With our early success with Leia’s puppies and implementing early neurological stimulation training, I’m certain we will continue to grow and seek out new challenges. Our hope and mission is to facilitate loving, trusting, connective relationships between canines and students to provide long-lasting healing to our families. Click here to learn more about Calo Young Adults.